Bright headlights causing concern for other drivers. 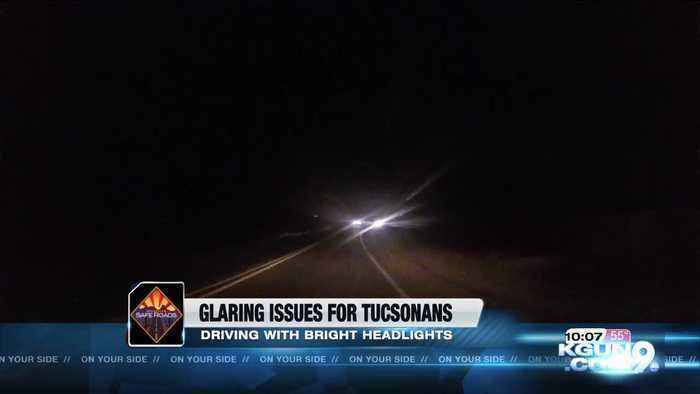 PUBLIC'S MIND -- THE GLARE OFBRIGHT HEADLIGHTS.SOME TUCSON MOTORISTS SAY IT CANCAUSE A DRIVING HAZARD. HERE'SNINE ON YOUR SIDES IVANRODRIGUEZ.IT'S AN ISSUE YOU MIGHT NOTTHINK ABOUT UNTIL YOU'RE DRIVINGATNIGHTBUT FOR AN INSTANT -- A BRIGHTFLASH FROM ONCOMING TRAFFICHEADLIGHTS CAN AT THE VERY LEASTBE BOTHERSOME.PATRICIA MANSPEAKER, TUCSONDRIVER I THINK IT'S BOTHBOTHERSOME AND DANGEROUS. ITHINK IT'S DANGEROUS WHEN YOU'REGOING HEAD ON TO PEOPLE AND ITHINK IT'S DANGEROUS IN THE REARVIEW MIRROR.PATRICIA MANSPEAKER IS ONE OFSEVERAL PEOPLE WHO TELL KGUNNINE -- DIFFERENT KINDS OFHEADLIGHTS AND COLORS MAKE ITHARDER TO SEE WHILE DRIVING.PATRICIA MANSPEAKER, TUCSONDRIVER BLUE LIGHTS AND SOME HAVEDIFFERENT SHAPES, MOTORCYCLES,THAT'S A LITTLE FRIGHTENING.THE NATIONAL HIGHWAY TRAFFICSAFETY ADMINISTRATION --OR NHTSA -- SAYS THEY'VERECEIEVED THOUSANDS OF SIMILARCOMPLAINTS REGARDING BRIGHTHEADLIGHTS.ALTHOUGH THERE IS A LEGALMINIMUM AND MAXIMUM BRIGHTNESSAUTOMAKERS MUST ABIDE BY --MANSPEAKER SAYS IT MIGHT BEWORTHRECONSIDERING.PATRICIA MANSPEAKER, TUCSONDRIVERYEAH I THINK IT SHOULD BEABSOLUTELY REVISED AND IF NOTREVISED, RE-INVESTIGATED.JEFF ASMAN, TUCSON DRIVERYOU HAVE TO KIND OF CLOSE ONEEYE AND LOOK AT THE LINE ON THERIGHT HAND SIDE OF THE ROAD TOBE SAFE.MANY TUCSON ROADS REMAIN DARKBECAUSE OF LIGHT POLUTIONREGULATIONS FOR KIT PEAKOBSERVATORY.JEFF ASMAN SAYS WHAT ALSO MAKESTUCSON ROADS PARTICULARLYHARDER -- ARE THE WINDING AND UPAND DOWN ROADS.JEFF ASMAN, TUCSON DRIVERYEAH SOMETIMES YOU'RE JUSTBLINDED AND YOU PRETTY MUCH JUSTHAVE TO SLOW DOWN, SOMETIMESDRAMATICALLY BECAUSE YOU CAN'TSEE WHERE YOU'RE GOING.